Western blot analysis of extracts from HeLa cells, mock transfected (-) or transfected with siRNA targeting human DAF/CD55 (+), using DAF/CD55 (E4G4T) Rabbit mAb (upper) and β-Actin (D6A8) Rabbit mAb #8457 (lower). 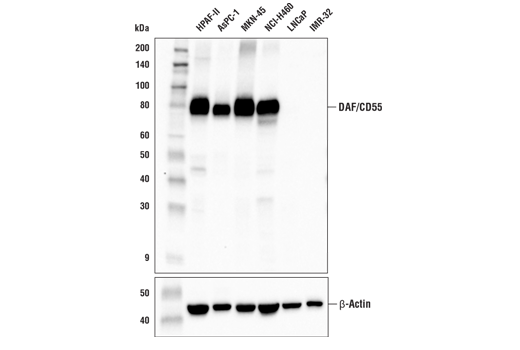 Western blot analysis of extracts from various cell lines using DAF/CD55 (E4G4T) Rabbit mAb (upper) and β-Actin (D6A8) Rabbit mAb #8457 (lower). As expected, DAF/CD55 protein expression is not detected in either LNCaP or IMR-32 cells. 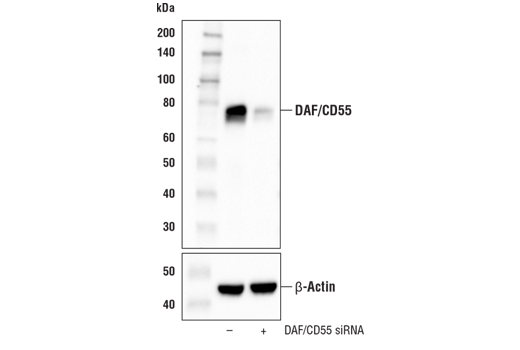 DAF/CD55 (E4G4T) Rabbit mAb recognizes endogenous levels of total DAF/CD55 protein. Monoclonal antibody is produced by immunizing animals with a synthetic peptide corresponding to residues near the amino terminus of human DAF/CD55 protein.